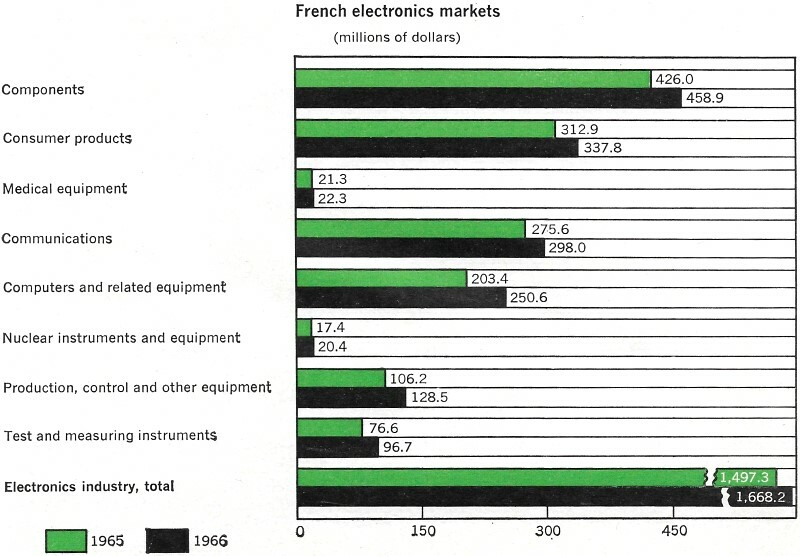 This is the electronics market prediction for France, circa 1966. It was part of a comprehensive assessment by the editors of Electronics magazine of the state of commercial, military, and consumer electronics at the end of 1965. President Charles de Gaulle wanted more money spent on the military - their "force de frappe" (strike force). Compagnie Générale de Télégraphie Sans Fil (later Thomson CSF) was building ground and airborne radars, IC productions was ramping up; computers were coming online, and basic R&D funding was increasing. Unless you can find a news story on the state of the industry, detailed reports must be purchased from research companies like Statista. Their website has a lot of charts on France's current electronics market showing revenue in the consumer electronics segment amounts of US$5,793M in 2018. Separate reports are included for West Germany (the Berlin Wall was still up then), the United Kingdom, France, Denmark, Austria, Sweden, Belgium, Switzerland, the Netherlands, and Italy. Russia, although obviously not part of Europe, is also covered. Big increase in military spending to aid electronics. President Charles de Gaulle wants more money spent on the military - more than is spent by any other Western European country. 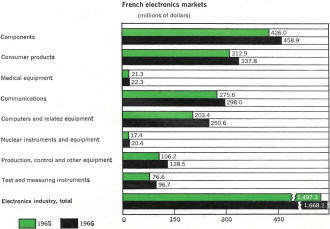 He'll have his way - and as a result will boost France's electronics market 11.4% to $1.6 billion in 1966. De Gaulle's "force de frappe" provides a growing market. The military will pour $290 million into electronics, up 20% in a year. Other segments of the electronics business also look for increases. Computer purchases are booming, and will reach $250 million, a 23% increase from 1965. The component industry will climb to $458.9 million. Sales totaled $426.0 million in 1965. On the other hand the television market appears to be little more than marking time with sales of $285 million expected in 1966, a 5.5% increase which depresses the industry's total percentage of growth. De Gaulle's efforts to build a complete defense capability in France has spurred French firms to develop new capabilities, and has protected them somewhat from foreign competition. However, because France is short of cash, the French military is still forced to buy many items on the world market on a low-bid basis. Big military-oriented companies such as Compagnie Générale de Télégraphie Sans Fil (CSF), the largest electronics concern in France, have benefited from increases in electronics budgets. CSF, which does about two-thirds of its business in military electronics, builds both airborne and surface radar, and is working on phased-array radars. CSF produces air-defense radars operating on a wavelength of 10 centimeters, and long-range surveillance radars operating at 23 centimeters, with peak powers of two megawatts. CSF has the bombing-navigation radar for the Mirage 4, and supplies electronics for France's fledgling space program. Electronique Marcel Dassault (EMD) supplies an analog type of computer for the Mirage 4 bombing-navigation system. EMD, which does most of its business with the military, also builds ground-checkout equipment for Mirage 4. Compagnie IBM France, an affiliate of the International Business Machine Corp., is one of the exceptions to the "buy French" policy. The firm has a number of contracts including the computers and data processors for the new French air-defense system, Strida 2. French firms are also putting their technology to work in civilian avionics. CSF, in work sponsored by the French government, is developing solid state airborne navigation and landing equipment, both for airlines and military use. CFS also is the prime contractor on a traffic-control simulator scheduled in 1966. Societe Francaise d'Equipments pour la Navigation Aerienne makes aircraft gyro instruments and automatic pilots. The French firms also manage to snare a share of the military business in other European countries. The Austrian air-defense system was reportedly built by CSF; Compagnie Francaise Thomson Houston (CFTH) served as technical adviser for the Western European Hawk missile program, and Laboratoire Central de Télécommunications (LCT) will build the European Space Research Organization's ESRO 1 polar ionosphere satellite. LCT is a subsidiary of the International Telephone and Telegraph Corp.
Thomson Houston, which has about 10% of its business in the military - mostly in ground and shipboard radar - is building high-power air-defense radar systems for Sweden. Although French firms complain about the lack of government dollars for research and development - and also say they are lucky to get $1 in R&D contracts for every $5 they invest on R&D - they are active in research, from communications to radar to lasers. CSF has the most irons in the fire. It points to some $2 million to $4 million annually in research contracts from the United States Department of Defense. CSF is working on a troposcatter system that it says will give the same or slightly better results as present quadruple-diversity systems but will cost about 30% less. Another effort is with a system to bounce communications signals off the ionosphere. Basically, the technique, which has been tested in a simulated ionosphere, would consist of mixing two transmitter beams in the ionosphere to produce a harmonic which would be stronger than either input beam. Tests in the ionosphere are scheduled for 1966. CSF is also deeply involved in the development of lasers, solid state devices, the detection of clear-air turbulence by an infrared radiometer, and the use of holograms for data processing and automatic-reading machines. Other companies working with lasers include Société Anonyme de Télécommunications, Compagnie Générale d'Electricité, and LCT. LCT is also working on an experimental airborne computer using microcircuits, and will deliver to the French military in 1966 a scaled-down version of a pulse-code modulation system built with integrated circuits. Another firm, Société d' applications Générales d'Electricité et de Mécaniques, which developed inertial guidance systems for the French ballistic missiles, reportedly is applying semiconductor microcircuits to its digital computer and inertial platform developments. IBM France reportedly has studies under way for development of an airborne digital computer for use in the Concorde, the Anglo-French supersonic transport. The emphasis on research has caused a boom in the market for laboratory instruments. Sales increased from $60 million to about $77 million in 1965 and are expected to rise another 26% to about $97 million in 1966. American companies have been getting about half of this business. Until recently there was a simple explanation for this: French companies, with their limited market, just couldn't afford to make the broad range of instruments offered by the American firms. However, as the market has grown so have the lines of French manufacturers until today they make just about all the equipment that their U. S. competitors do. Some U. S. firms assemble instruments in Europe. For instance, the Hewlett-Packard Co., assembles many of the instruments it markets in France at its British and German factories but most of the components it uses come from the United States. Television has been growing slowly, with an increase in sales of 5.5%, up to $285 million in 1966 from $270 million expected this year. About 40% of French homes now have tv sets. One reason for this relatively low percentage may be the strict governmental control of programing which has limited the entertainment value of television. The second set is almost nonexistent in French homes. Radio sales are expected to drop from $52.6 million this year to $51.5 million in 1966. Like many other countries, France expects color television to boost tv sales, but not in 1966. 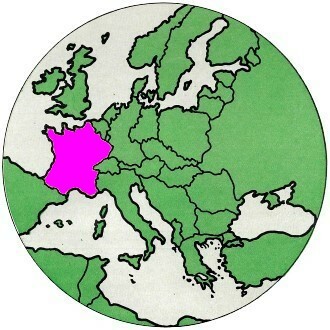 France has an additional interest in color. The French color system, Secam, is being vigorously promoted throughout Europe. Compagnie Française de Télévision, a 50-50 affiliate of CSF and Saint-Gobain, the large French glass and chemicals firm, controls the process. The French government has strongly backed efforts in behalf of Secam. Although on the surface not much has happened since last spring, when the Soviet Union announced its support of the French system, CFT has been busy behind the scenes lining up votes for Secam. It apparently has a long way to go before convincing the whole of Europe to adopt Secam, but CSF officials confidently declare that they have eliminated the American National Television Standards Committee (NTSC) system from the race. This leaves the West German PAL process, or some variation of PAL, in their view as the main competition. Alain Peyrefitte, the government's minister of information, says that regular color telecasts will start in September, 1967, a year earlier than planned. However, it will be several years after that before color sales will become a factor. CFT is now tooling up to produce a tube that might have a strong impact on the European, and eventually the world, color-tv market. It's a bright, easy-to-build color television tube that is expected to cost one-third less than present shadow mask tubes. The growth rate of the French computer market is making the International Business Machines Corp. happy; IBM is generally understood to have installed three of every four machines in use in France. In 1966, sales are expected to shoot up about 23% to $250 million. This year sales were $230 million. GE-Bull, an affiliate of the General Electric Co., is going after some 15% to 20% of the French market. Two French firms, CSF and Compagnie Général d'Electricité, have a joint entry in the computer field. The firm, Citec, is developing process-control computers and recently formed a consortium with two British firms which has applied to the French and British governments for financial backing to build a scientific computer. Roger Aubert, CSF general manager for technical matters, predicts a growth of 300 to 500% a year in the process-control field during the next few years as French industry automates. IBM and GE-Bull executives agree that process control has a big future in France, but plan to sell their general-purpose equipment to the market. Although big growth is predicted, one problem is pointed out by Donald W. Pendery, IBM director of data processing for Europe. "The lack of trained people could become the really limiting factor in the growth of the computer market. Management is almost always behind the introduction of computers, but if they can't get people to run them this will be a pretty theoretical interest. Pendery doesn't see anything else to prevent the European market from growing as did the U.S. market. "The growth rate, however, is probably that of the U.S. several years ago," he says. 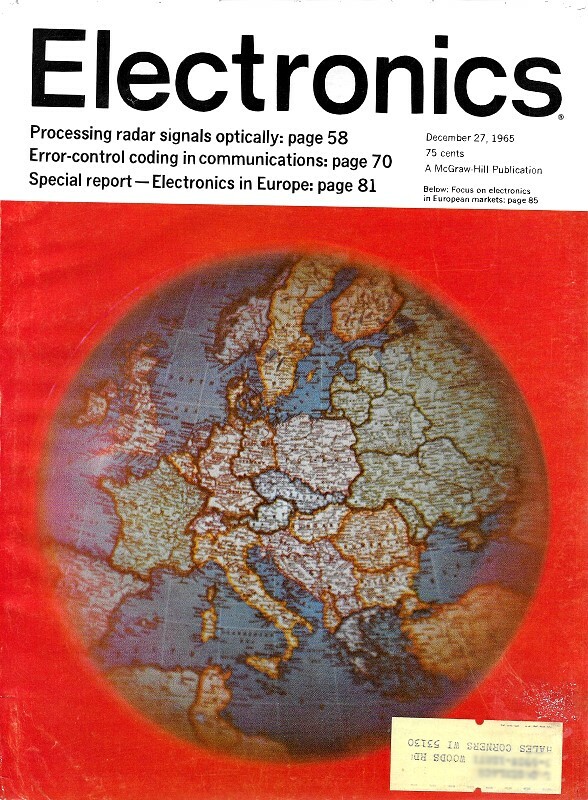 France, like other European countries, has been slow in producing integrated circuits. Foreign firms with mass production were able to beat prices set by French companies despite the 15% duty the French apply on most semiconductor imports. However, France's three largest semiconductor companies will start to mass-produce integrated logic circuits in 1966. They are CSF, La Radio-technique, a subsidiary of Philips Gloeilampen-fabrieken, N. V., of the Netherlands, and Société Européene des Semiconducteurs (Sesco), a joint venture of Compagnie Française Thomson-Houston and the General Electric Co.
Texas Instruments Incorporated is the fourth largest semiconductor producer in France, and the Societá General Semiconduttori (SGS) of Italy has just opened a new plant.